This article is written to help you get started flying RC. We want you to be successful in the hobby. The more successful you are starting out, will determine whether or not you will continue with the hobby. The most important first step is get an instructor to help get off to a good start. This article is not a substitute for having a good instructor. It is to help guide you through the hobby. Most important thing is to head out to your local flying field and talk with people flying. The RC hobby is one of the most rewarding and exhilarating hobbies out there and the friends you make will last a lifetime. You can also visit our frequently asked questions page to help answer some general questions regarding flying RC. OK, let's get started. Okay, you have been bitten by the R/C plane bug, seen them fly, drooled over them in the local hobby shop and read about them in a magazine or two and are just about to part with some hard earned cash to get started. But there are a lot of mysterious R/C airplane terms being thrown around and many options out there, so how does a pilot starting out make the good choice? Fortunately there are some good choices as can be seen by what happens at the local flying field. There are guys flying that are making it look easy, but as with most things making it look easy takes a lot of work and good decisions to get to that point. So what kind of airframe works the best for someone getting into the hobby/sport of flying R/C planes? A trainer. Don’t let the name fool you. A trainer plane should let you learn the basics from just cruising around the field to loops, rolls, stalls, spins, takeoffs and the always difficult landings. If your trainer lasts through all of these it has done its job. Newbies can spend a season and a half fully learning everything a trainer plane can teach you. Then you can add floats and use that same plane to learn to fly off water, which will be a different discussion. Scanning the places that sell trainers you will notice common themes that start out with an airframe with a high wing. A high wing with all the weight under it adds stability. Most wings on trainers have a bit of dihedral which is that up angle from the center of the wing to the wingtip. Dihedral adds some automatic settling back to right side up in the roll axis, a little bit of help that is good for beginners. Many trainer wings are rubberbanded on with the thinking that if a wingtip snags the ground on a less than perfect landing or takeoff, the wing will rotate and pop off the rubberbands doing less damage than if the wing was bolted on to the fuselage. We have seen mixed results on that option. By the time you have enough rubberbands on to keep the wing in place during flight, the rubberbands can hang on hard enough to not let loose in a mishap. Looking at the wingtip you will notice a flat bottomed airfoil on the wing. This type of airfoil gives good lift at slow speeds and stalls at a lower speed than an airfoil that is symmetrical or semi symmetrical. Do NOT get a high wing "trainer" looking plane with a symmetrical airfoil. It will eat you for lunch. It will fly too fast, react to inputs too readily and will land way faster than a beginner needs, very deceptive. 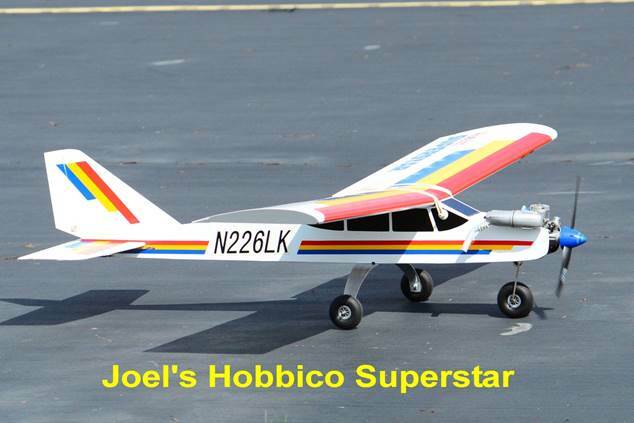 Hobbico Superstar .40 sized trainer. Joel changed to aluminum main landing gear after the wire landing gear lost its ability to stay correctly bent after many landings. Note the flat bottomed airfoil. Tricycle landing gear is usually found on a trainer due to it being much easier to tame the ground handling especially takeoffs than with taildragger landing gear. Let’s save the adventures of taildraggers for later. Sticking with glow planes for now, on the frontend the engine is not enclosed in a cowl so working around the engine is easy. Refueling, carb adjustments, choking the carb and glowplug access is easy. Being open also makes adjusting the nosewheel easy and gives you the ability to keep an eye on the hardware that holds the engine to the engine mount and firewall and those muffler bolts that might work loose due to engine vibration. All of these suggested planes are four channel or four functions. Elevator, aileron, throttle and rudder are being controlled from the transmitter. We don’t suggest three channel or function planes that are rudder, elevator and throttle if you have access to an instructor. They don’t teach the roll maneuvers which require more coordination to do successfully. And they can lead to overconfidence when moving up from the three channel plane to the four channel planes. A quick roll is a plane killer when you are not ready for it. Three channel planes are a lot of fun but not learning on a four channel plane seems to stunt the flying growth of some students. If you can’t get an instructor’s help then by all means get flying on a three channel plane. Can you learn you fly with a low winged symmetrical airfoiled, taildragger plane? Yes you can. The learning curve will be much, much longer due to all aspects of learning to fly being much more difficult and dangerous. For example, if the ailerons react quickly a novice will over control not being able to make simple oval circuits around the field. Turns that require coordination of aileron and elevator are harder to get timed right and if done wrong will cause the novice to over control more to try to recover. They are already behind the plane and it will just get worse. Find out who at the local R/C club is an instructor and find out from them which trainer planes have been working well for the new guys. Watch the recommended trainer planes in action if possible and talk to the new pilots. Often they will be able to make valuable suggestions because all they have learned is still fresh in their minds. Sometimes the club has a trainer plane available for an introductory flight! The radio system is a purchase that should be made looking towards the future. Do not put money into a system you will outgrow by your second plane. Get one that has some growth in it. Lots of confusing options here. 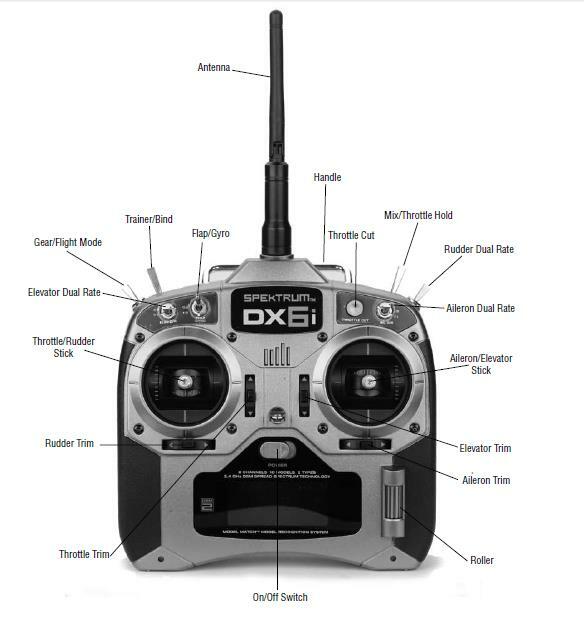 Here again it is a good idea to go to the flying field, talk to the guys, see which transmitters fit your hands, which ones feel balanced. As a newbie it may be hard to tell what you like, but it can be easy to tell what you don’t like. And talking to the pilots you can start to pick up on all of that cryptic radio gear lingo. Systems that would be worth looking at would be like the Futaba 6EX and Spectrum DX6. These are six channel radios which mean that six functions can be controlled. As mentioned above most trainers use four functions (I don’t know why they call them channels? ): elevator, aileron, elevator and throttle. Why not get a four channel system? A few planes down the road if you wanted to try a couple of extra functions such as flaps, retractable landing gear, a smoke system or scale bomb drop you would not have the capability. Seven channel radios like Futaba 7C and Spectrum DX7 are also worth taking a look at. You will be able to grow for several years with these radios. Three features that pilots find most useful are end point adjustment, servo reversing and dual rates which are not available on a lot of four channel systems. End point adjustment lets you control the max amount of servo throw from settings on the transmitter. Very helpful when the mechanical setup is not quite where you want it. Servo reversing is helpful for when you are checking out your latest creation and discover the mechanical operation of a servo is backwards of what is desired, left is right or up is down. Go the servo reversing option and reverse it! Dual rates is an option that lets you set up two endpoints on a flight surface. They are controlled by toggle switches. Most pilots set up the toggle switches for max throw in the up switch position and reduced throw in the down switch position. Dual rates are usually available on rudder, ailerons and elevator. Dual rates might not seem like a very useful option but it can make your plane two different reacting planes at the throw of a switch. Think of the option to try a new hot maneuver or two but still having the tame plane on takeoff and landing. Rechargable batteries are also a very nice feature most six channel systems offer and not all four channel systems offer. Manufacturers are very good about putting their radio system manuals on the web so comparisons can be made. A page from the Spectrum DX6 manual is shown below. Included in most systems are a transmitter, receiver, servos, switch harness, rechargeable batteries and battery charger. Intimidating at first but the pieces will fall into place after a few conversations with some experienced fliers and after you work your way through that first radio installation. First things first, the engine size is cubic inches of displacement just like the 350 in your first Chevy, okay 351 for you Ford guys and 340 for the Mopar guys. A .46 has 46/100 cubic inch of piston displacement and is called a forty six by the guys at the field. A 1.20 has 1.2 cubic inches of displacement and is called a one twenty. Here again it is a smart idea to get a good piece of equipment. It is really frustrating to show up at the flying field and have an engine that is uncooperative. Also this is a confusing area of the hobby to figure out. There are lots of new terms and things to learn. Engines with bushing supported crankshafts are a lot cheaper than ball bearing supported crankshaft engines, Air bleed vs. fuel bleed carburetors, two stroke or four stroke where does one start? The easy answer is an O.S. engine. They are a bit more money but they always work well. Any of the guys at the field can help you with prop selection and operation. What the extra money gets you is the easiest to adjust carb on the market. Put it on the plane, break it in and go fly. As a beginner you don’t want to be fighting an undependable engine when you are trying to learn to flying. The bushed engines are not as powerful as the ball bearing engines. They turn lower RPM so the crankshaft doesn’t outrun the lubrication. This is not an issue on the ball bearing engines. O.S. 46AX two stroke glow engine. Choose the larger engine suggested on the range of engines printed on the box that the airframe comes in. This is especially true if you are going to be flying off of a grass field. Air bleed carbs work well and are easy to set, although they might not be as crisp on throttle response as fuel bleed carbs. Two stroke or four stroke – your choice, they both run well and it is usually an exhaust sound preference. 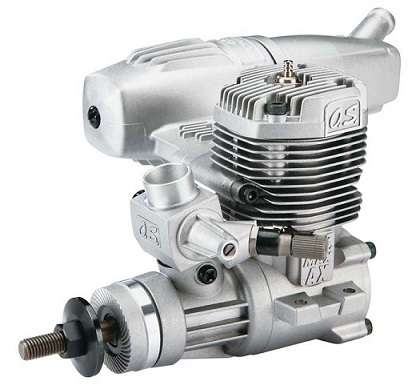 Saito is a manufacturer that only offers four stroke engines. They are a solid running engine. We are talking about glow fuel engines here and they run on a mixture of alcohol, nitro, and castor or synthetic oil, or a mix of castor/synthetic oil. Catalytic combustion of the glow fuel is caused by the fuel vapor coming in contact with a glowing platinum coil wire in the glow plug. Glow fuel is safer than gasoline for obvious reasons but larger gas engines are popular with the guys who fly BIG R/C planes for fuel cost reasons. With proper care these engines last a long time so if at all possible choose an engine that can migrate to that second or third plane. Hopefully some of this information helps. We have only scratched the surface on the amount of information you will eventually acquire once you have been in the hobby/sport for a while. But most hobbies are like that. If you could figure it out and conquer it in a couple of weeks it wouldn’t be much of a hobby now would it? Electrics are another branch of R/C flying we will explore so stay tuned if your interests are in that area. Almost every glow pilot flies electrics too. If it has wings it is neat! See you at the field.